As the space designed for relaxation and recreational activities, the living room is crucial for the comfort and convenience you expect out of your home. This room is meant to hold your family and guests for a wide range of activities, making it essential to find the modern lighting fixtures that can create dramatic improvements in the aesthetics of your living room. Nebraska homeowners who are looking for outdoor and indoor lighting products to match their unique styles and budgets can benefit from visiting The Light Palace. Since 1953, our expansive Omaha lighting showroom and courteous staff have worked diligently to produce the best results for each of our customers. We’re as dedicated to the successful outcome of your residential lighting project as you are, and our team will work hard to find the best solutions for all of your needs. Home lighting fixtures come in all shapes and sizes, with different styles being made for varying uses. Today, we’ll highlight a few helpful living room lighting tips to help you create a plan for your Nebraska home. Once done, be sure to stop by our lighting showroom for the best advice and products at the best prices! The overall needs of your recreational room will depend on a few elements, including what you plan on doing with the space. Do you watch long spans of TV with the family? Are you more into literary adventures? Maybe you prefer to host social events while entertaining all of your guests? Your living room is designed to provide a range of conveniences for your daily life, and constructing your lighting scheme to highlight one primary goal can help to enhance the enjoyment of said activity. For many Americans, the TV serves as a centerplace for the family, providing good laughs and cherished memories. Television is a sort of break for many of us, allowing many people to rest and relax after a tough day at the office. While TV is a regular occurence in American households, the introduction of artificial light can change your lighting needs. Ambient lighting for TV enthusiasts should focus on lighting control to avoid eye strain and fatigue for your guests and housemates. It’s important to provide enough light to be safe, but remember that too much can create unsightly screen glares. Dimmers are the name of the game here, as you can utilize one or more switches to find the perfect level for your television activities. Task lighting is not a top priority here, as the focus centers around setting the stage for the tube up front. It’s important to include some task elements such as a table lamp to provide lighting for special tasks where overhead lighting is not enough. Remember that less can be more when it comes to lighting schemes. Accent lighting will be minimal here as well, as your guests will be focused on one central source of light. Homeowners with awesome features they want to highlight can utilize small accent lamps to create depth and drama, but remember that too much light can create unwanted reflections on many of your surfaces. Ambient lighting is one element that needs to be strong enough to provide general illumination over the entire room. Without worrying about the glare of a television, you have more freedom to find home lighting fixtures and styles that match your style. In this case, it’s important to simply create a general lighting balance with flush-mount fixtures, floor mounts, sconces, and more. As long as the room isn’t too bright, you should be happy with the results. Task lighting is where your living room sinks or shines for literary purposes. Reading a book, magazine, or novel requires adequate light to reduce the strain placed on your eyes. Task lighting here can consist of many different fixtures that all work to light up your space when needed. It’s important to focus on the balance of lighting to ensure long-term comfort for those addicting reads! Accent lighting is beneficial here, but not as much as its task-oriented counterpart. Readers who are proud of their collection can spotlight a bookcase or highlight a valued collectible. As long as your accent lighting doesn’t overpower your task elements, everything should work out fine. The living room is a versatile space that can accommodate a large range of activities. Unfortunately, the many uses of this room can make it challenging trying to develop a modern lighting scheme. Next time, we’ll continue on this topic by highlighting a few more considerations for your living room. 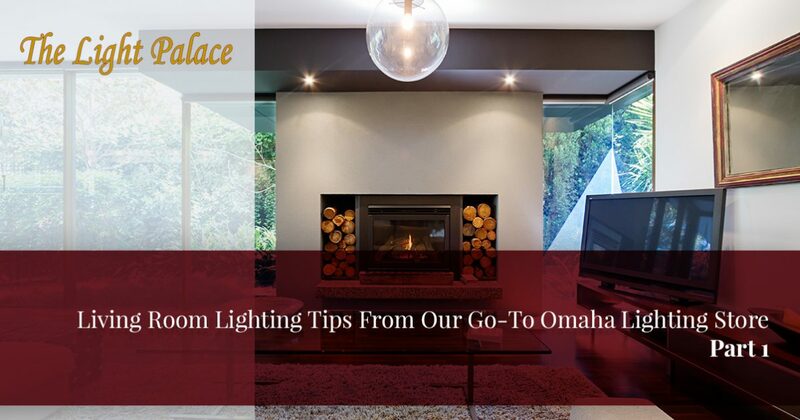 If you’re in need of a quality lighting store in Omaha, The Light Palace is here to help! Our experienced staff and expansive showroom ensure that you receive the best service. Contact us today to learn more or stop by our lighting showroom for assistance!